“What you are is what you have been; what you will be is what you do now.” – Whats your superpower? May your year be a year of miracles. 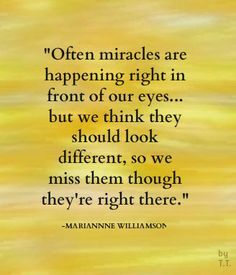 Marianne Williamson describes a miracle as a shift in thinking from fear to love. How does shifting a thought cause a miraculous change? Her answer: Mind is Cause and the world is Effect – we change the world by changing the thoughts we think. The quote (the title of this post) is by Buddha. Our lives change from moment to present moment. What we do now, will affect what happens next. What we think, the meaning we ascribe to things, will change as our thoughts change. What we manifest will depend on our habits. And change will only come if that is what we want. No one will reward you for your habits. Almost no one will even notice them. So if you are not developing them for you and you alone, then they will never stick around. Trying to create new habits for “someone else” is a waste of time. Doing it because you feel “compelled” to do it won’t work. Do it for you. Do it because you want it. As you embark on your 2016 journey, remember always WHO YOU TRULY ARE and the power you already possess! Previous postWhy Are We Still Failing At Customer Service?